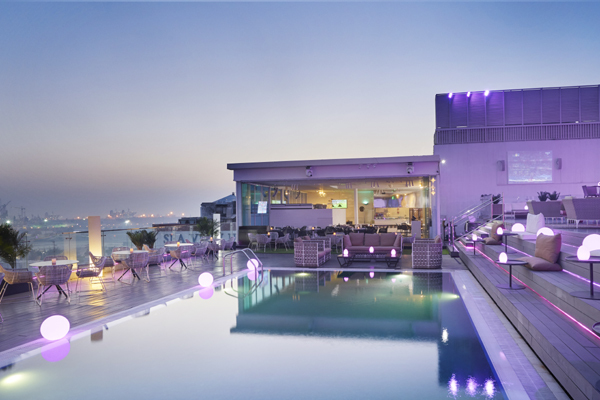 MGallery by Sofitel, AccorHotels' collection of unique boutique hotels, welcomes its second property in Dubai with the rebranding of the Meliá Hotel in Bur Dubai’s Port Rashid area to The Canvas Hotel, MGallery. The franchise agreement was signed with Khamas Group of Investments, a multi-industry conglomerate. The name ‘Canvas’ was chosen in tribute to the way the city of Dubai has developed, transforming from the ‘blank canvas’ of the desert sands into a glittering metropolis. The upper upscale property features 164 rooms and suites, an all-day dining restaurant, three lounges, Signature, a renowned Indian restaurant from the internationally acclaimed celebrity chef Sanjeev Kapoor, as well as an award-winning spa. As part of a phased refurbishment, The Canvas Hotel will redefine the guest arrival experience and the lobby in line with the MGallery ethos, from the intimate and private arrival to the welcoming atrium on the first level, where new lighting, furnishings and refined regional art will uplift and enhance the atmosphere. Signature, by Sanjeev Kapoor, will take over a prime location of the main lobby, while additional space is being used to upgrade the events and meeting space, with state-of-the-art audio-visual fit-out. After completion of the second phase of refurbishment, The Canvas Hotel, drawing on MGallery’s flair for unique dining experiences, will have seven enticing concepts inspired by the heritage of its surroundings, as well as catering to business travellers, with two fully-equipped meeting spaces. The revitalisation of the property is part of the on-going evolution of the historically significant area of (Port Rashid) Bur Dubai, which is being carefully preserved to protect the city’s heritage and history. The hotel is convenient for sites such as the Dubai Gold Souq and Al Fahidi Historical District or new developments such as La Mer and The Pearl Jumeirah, while being incredibly close to ‘Banks’ street, the Dhow Wharfage, and the consular district. The launch of The Canvas Hotel, MGallery accelerates the expansion of MGallery in the Middle East, a collection of inimitably enchanting, unique boutique hotels. MGallery places story making at the heart of the services, amenities, décor and dining concepts across each hotel. Offering a mix of Heritage, Serenity and Signature hotels, MGallery hotels offer one-of-a-kind moments, spirited by local experiences, lively food and beverages and customised discovery tours. MGallery has more than 90 unique addresses including flagship properties such as Hotel Molitor Paris MGallery, Le Grand Hotel Cabourg MGallery, Santa Teresa Hotel Rio de Janeiro MGallery, Hotel des Arts Saigon MGallery and others in over 25 countries around the world. The Retreat Palm Dubai MGallery was the first in the Middle East in addition to becoming the first wellness-focused resort in the region when it opened its doors last year.